Kalokairi Island in Greece will be familiar to anyone who watched the wildly successful and popular Mamma Mia! movie. The film, released in 2008 and directed by Phyllida Lloyd, was a smash success based on the 1999 musical of the same name, which is based on the songs of one of the world's biggest pop groups of all time: ABBA. Kalokairi Island was a name completely made up by the films' producers, but the word 'kalokairi' is a real Greek word that translates to 'summer'. Since this island is simply so beautiful and picturesque, it's always been a big tourist destination, with tourism actually being the main driving force of Skopelos' economy. Since the release of Mamma Mia!, more people have become aware of this beautiful Greek island and wanted to visit it for themselves to live out their own little version of the movie musical. In the past, most of the tourism on Skopelos was from Greek people, but it's now not uncommon to see Americans, Brits, and many other nationalities roaming the streets and relaxing on the beaches of this stunning spot. Visiting Kalokairi or Skopelos Island is actually a little trickier than you might imagine as the island itself naturally doesn't have its own airport. Greece has a lot of different islands and tries to preserve them as well as possible, so it's rare to find airports on places like Skopelos in general. This means that boats are the only really way to get around among the Greek Islands. One of the best ways to get to Kalokairi Island is to fly into Athens, which has the largest and best-served airport in the entire country, and then hop on a connecting flight to Skiathos, which is an island in the Aegean Sea that serves as a kind of gateway to many other Greek Islands. From Skiathos, you can take boats across to Skopelos. There are plenty of great places to stay on Kalokairi or Skopelos Island, including local hotels and accommodation, as well as the possibility to simply rent a villa or apartment on the island using various booking sites. If you love the movie and want to stay in a location that really means something special, it's important to note that the film's fabled Villa Donna hotel doesn't actually exist. You can however, stop off at the Hotel Skopelos Village, which is where some of the movie's stars like Meryl Streep and Pierce Brosnan spent much of their time in between shoots. You can even scroll back in the guest book and check out the messages they wrote before they left, and there's a specialized 'Mamma Mia' suite that can be booked at an additional fee. Villa Metochi and Pyrgos Villa were also used by the film's stars and can be booked to serve as your vacation accommodation. Once you’ve chosen your place to stay, you’ll want to get out and start exploring the island itself. 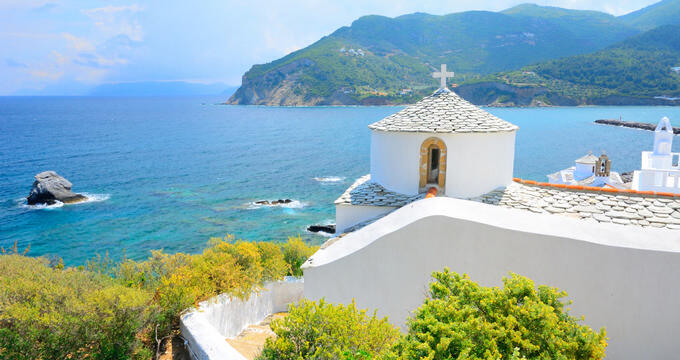 Skopelos, like many other beautiful Greek islands in the Aegean Sea, is quite small and simple, so visitors shouldn't expect to find dozens of attractions or man-made things to do, but should instead expect a sublime environment in which to unwind, relax, and de-stress. Mamma Mia! fans will love to head down to Kasteri Beach, where plenty of key scenes from the film were shot, and you can also find the little chapel where some of the wedding scene was shot as well. These locations are truly beautiful and will appeal to non-movie fans too, like the rest of the island as a whole. Overall, Skopelos is a very attractive and welcoming place that can be simply joyful to explore. Special events like live music, dance, and theater are sometimes held here, especially on February 25, which celebrates the island's patron saint, and during the Loizia Festival of August. Finally, when it comes to food on Kalokairi Island, expect to eat plenty of fish and seafood, plucked straight from the waters off the island’s shores.